This does not represent the views or opinions of anyone other than myself. Â Specifically but not exclusively, this does not represent the views or opinions of anyone with whom I have worked in the past, my employer, or anyone associated with ResNet, Inc. I am very, very sad to have to write and publish this entry. Â I have always thought very highly of ACUTA, the U.S. higher education professional organization that focuses on networking and telephony. They have produced high quality reports and conferences, including conferences and webinars at which colleagues and I have presented. Â They were also very gracious in allowing me to visit their headquarters in Lexington, Kentucky, a few years ago to comb through some of their historical archives as I performed historical research. 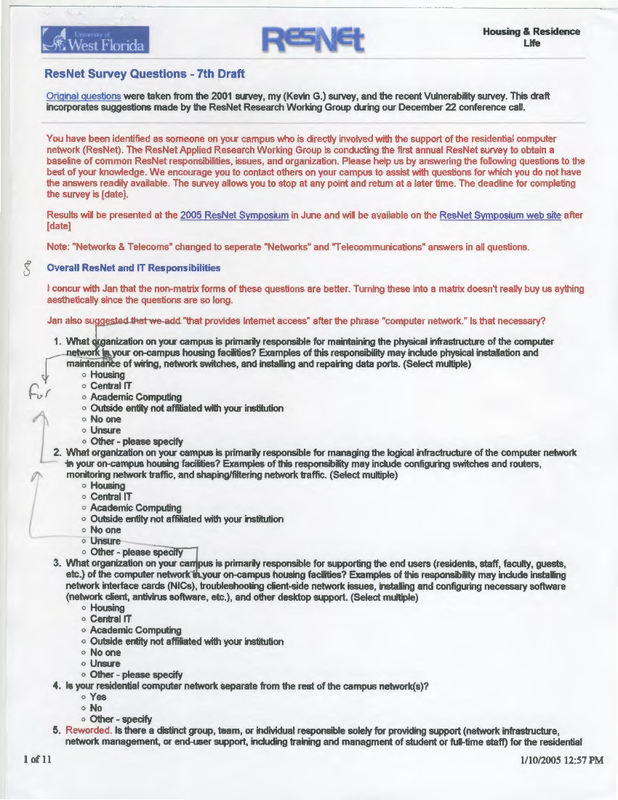 Six months ago, on April 6, I contacted ACUTA to draw attention to the material in the then-recently released ACUTA ResNet Survey that is identical to material in previous research conducted by me and other colleagues loosely associated with the ResNet Symposium (now the ResNet Student Technology Conference). Although ACUTA initially claimed that any similarities were “inadvertent,” they later admitted that at least 15 of the 45 questions – one-third – on their survey are virtually identical to older questions copied without attribution. Â Despite this admission, ACUTA has only impartially and reluctantly publicly acknowledged the previous work from which a substantial portion of their current survey was copied. In particular, the (a) summary report and infographic associated with ACUTA’s survey make no mention whatsoever of the previous work upon which those work are substantially built and (b) ACUTA website was only edited in the past few days, presumably in response to an e-mail I sent on September 28 allowing them one more week to make edits before making this issue public. This is not a legal issue. Â Although I am one of the copyright holders of the original 2005 and 2008 survey instruments and reports and I could pursue legal action against ACUTA and their contractor Forward Analytics, it is highly unlikely that I will do so. Â I have no interest in making money from my original work or the work performed by ACUTA and Forward Analytics. Â I’m not very interested in stopping ACUTA from conducting their surveys and publishing results; in fact, I’m quite pleased that the work is being continued and I am flattered that they believe that the survey instrument I helped create is of sufficient quality that they are reusing and building on it. This is an ethical issue. Â In academia, we respect the work that others have done by clearly drawing attention to it when we build on their work. Â It is right to give people credit for what they have done, especially when we are benefiting from that work. Â Moreover, it is essential that we give readers a clear idea of the provenance of our ideas so they can perform due diligence to assure themselves of the quality and rigor of our work. It is not necessary to ask permission to build on the ideas of another; as far as I am concerned, ACUTA is welcome to use, modify, and adapt questions from the survey instruments I helped to develop. But it is necessary to give us credit, both to acknowledge the work that my colleagues and I did and to allow others to know where some of the content in the ACUTA survey originated. Â I don’t think it’s asking very much when I have asked ACUTA to play by the same rules as everyone else in academia. Â I am perplexed and saddened that half a year ago I initially contacted ACUTA and since then they have not taken a few minutes to add a sentence or a footnote to their documents acknowledging the work on which theirs is built. Page one of draft 7 of the 2005 ResNet Survey. Note (a) the date in the bottom right corner: January 10, 2005 and (b) a note at the very top noting the previous research most influential on this instrument, an internal note that was later expanded when we solicited responses and published results of the survey. 1. Based on ACUTA’s report, their survey instrument asked “Is your institutionâ€™s residential network separate from the rest of the campus network(s)?” with the response options of (a) Yes, only physically, (b) Yes, only logically, (c) Yes, both physically and logically, and (d) No. 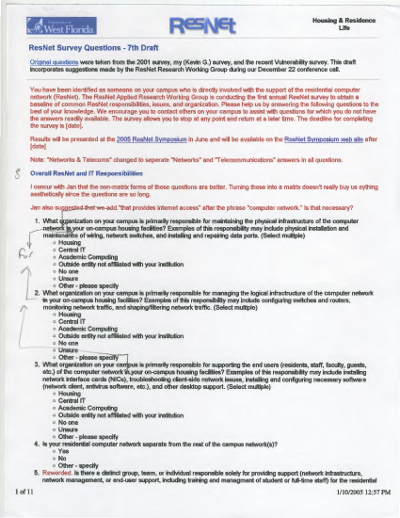 Â In 2005, my colleagues and I asked “Is your residential computer network separate from the rest of the campus network(s)? with the response options of (a) Yes, our residential computer network is physically separate, (b) Yes, our residential computer network is logically separate, (c) Yes, our residential computer network is both physically and logically separate, and (d) No. 3. ACUTA’s report states that “50% of IT Departments pay for bandwidth supplied to the residential networks but do not recover the cost.” Â In 2005, my colleagues and I asked “Who pays for the bandwidth available to the residential computer network and are the costs recovered? (Check all that apply)” with the response options of (a) An outside vendor supplies the bandwidth and recovers some or all of the cost through a charge to the university, (b) An outside vendor supplies the bandwidth and recovers some or all of the cost through resident fees, (c) Central IT pays for it and recovers some or all of the cost through fees to residents or interdepartmental charges to Housing, (d) Central IT pays for it and does not recover the cost, (e) The Housing department pays a non-university ISP and recovers some or all of the cost through rent or other fees, and (f) Other (please specify) [emphasis added]. entity not affiliated with your institution?” with the response options of (a) Yes, we have outsourced significant portions to a non-university organization, (b) Yes, we have considered outsourcing to a non-university organization but not pursued it, (c) We are considering outsourcing to a non-university organization right now, (d) No, we have not seriously considered outsourcing to a non-university organization, and (e) Other (please specify).